If you’re wondering what to put in a newsletter to send to your e-mail marketing list, you are not alone. In fact, based on my research over at WordTracker, hundreds of thousands of searches are run each month on this topic alone. So to help answer this question, and to also provide ideas for a newsletter, I created the handy infographic below. 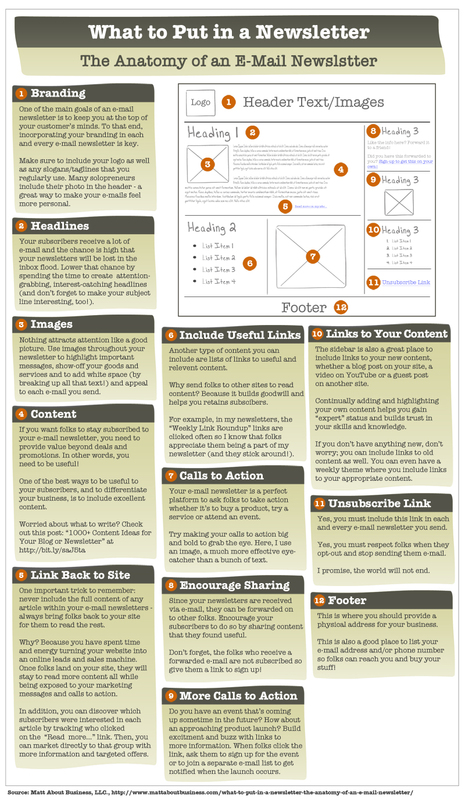 This infographic is aimed at helping you figure out what should be in your regularly-scheduled newsletter. Based on the experiences of both myself and my clients, this infographic is aimed at helping you figure out what should be in your regularly-scheduled newsletter, whether you send it every week, every month or every quarter. In other words, the infographic below does not address e-mails for special announcements or promotions. The contents of those types of e-mails can be very different indeed. Enjoy and, happy e-mail marketing! 9 Great Online Credibility Builders: Want to build trust and credibility online? Here are 9 spots that you should be sure to beef-up to make it happen. Chuck E. Cheese’s Charts Careful Social Expansion: An excellent social media case study. 5 Tools and Time Savers for the E-mail Addict: Some great tips and trips in this post. As Google Tweaks Searches, Some Get Lost in the Web: Some more info on how to deal with Google’s Penguin update. Finding the Best Time to Post to Social Networks: This is a perennial question from clients – here’s one take on an answer. 3 Steps to Determine if Social Local Mobile Is Right for Your Business: An excellent intro to So-Lo-Mo (social-local-mobile) and what it might mean for your business. 10 Ways To Amplify A B2B PR Campaign: Some excellent, actionable and easy-to-implement ideas in this post. Crowdfunding – Boom or Bust for Entrepreneurs? : Some easy-to-digest info about the new crowdfunding rules and regs. 6 Things You Need to Know About LinkedIn Recommendations: Basic but solid advice about LinkedIn recommendations. How B2B Marketers Can Succeed on the 6 Big Social Networks: Love these tips – very actionable and easy-to-implement! Wow! Just stumbled upon your website and I’m thrilled to bits. Everything about your website and your content resonate with me down to my toes. Gotta go – I have many more of your posts to read! Thanks so much for your kind words; I’m very happy that you find my site useful! Thanks also for sharing my infographics on Pinterest! If you’re wondering what to put in a newsletter to send to your e-mail marketing list, you’re not alone. To help you figure it out, I created this handy infographic….